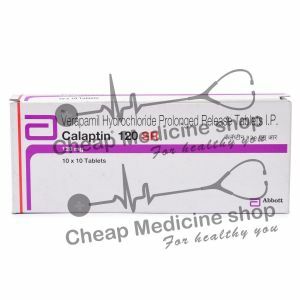 Calaptin-80 is marketed by Abbott Laboratories and is available at every leading online pharmacy, drugstore and medical supply store. The active ingredient present in Calaptin-80 is verapamil. 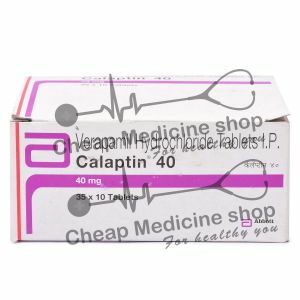 Calaptin-80 is primarily used for relief from signs and symptoms of supraventricular tachycardia, atrial fibrillation, hypertension and angina pectoris. Calaptin-80, the contains 80 mg of Verapamil, is manufactured primarily by Abbott Laboratories. It is mainly marketed and supplied by the company and its associates in India. 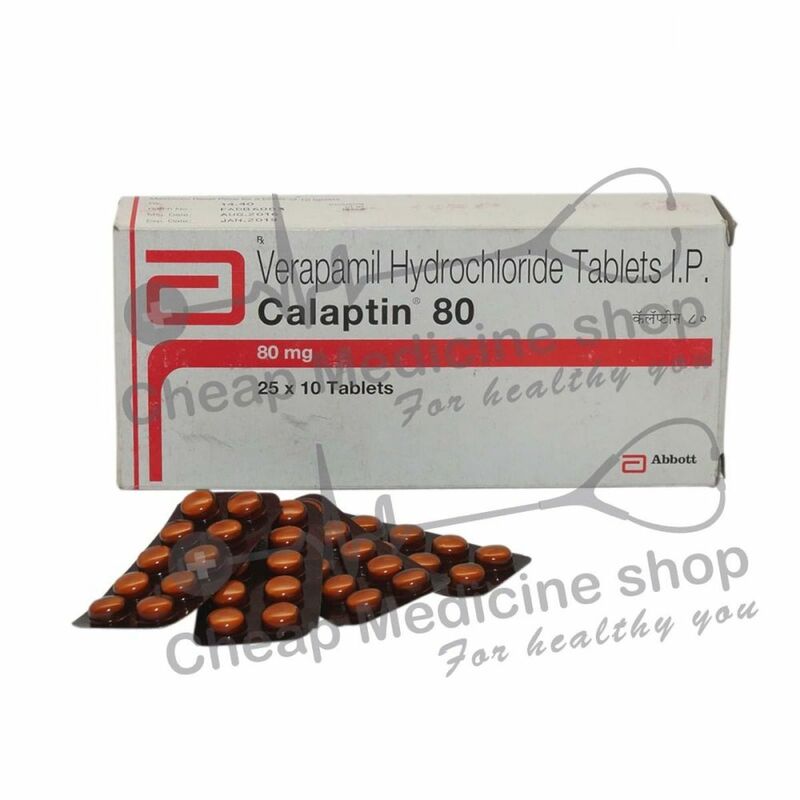 Calaptin-80 contains 80 mg of Vearapamil. Hypertension: It is a medical condition in which the blood pressure in arteries is persistently elevated. Verapamil, the salt present in Calaptin blocks the calcium channels present in the smooth muscles of blood vessels. This leads to the relaxation of blood vessels and thus helps in reducing the symptoms of hypertension. Supraventricular Tachycardia: It is a medical condition caused by abnormal and fast heart rhythm occurring due to the improper electrical activity of the upper part of the heart. Calaptin-80 improves the condition by blocking calcium channel blockers present in the AV node and SA node which leads to decrease in impulse conduction from AV and SA nodes. Atrial Fibrillation: It is a medical condition of abnormal heart rhythm characterized by rapid and irregular heartbeat. Calaptin-80 improves the condition by blocking calcium channel blockers present in the AV node and SA nodes which leads to a decrease in impulse conduction from AV and SA nodes. The drug mainly acts by inhibiting calcium channel blockers which are mainly present in the blood vessels, SA and AV nodes of heart. By inhibiting calcium channel blockers, the drug helps in dilating blood vessels and improve blood supply to the heart and thus helps in relieving hypertension and angina. By blocking calcium channel blockers present in AV node and SA node which leads to decrease of impulse conduction from AV and SA nodes, it helps in supraventricular tachycardia and atrial fibrillation. 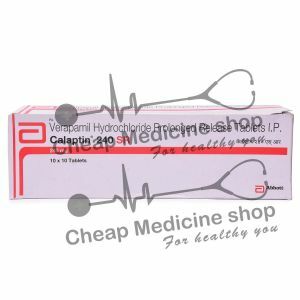 Calaptin, that contains the salt Verapamil, can be administered with regards to meals. Take the drug early in the morning if your drug is prescribed for once daily use. Strictly follow the instructions of your doctor while using this drug. Verapamil, the active salt present in Calaptin-80 is to be taken in dosages which range from 40 mg to 480 mg. A more specific dose will be directed by your doctor. How Long Should I Continue To Take Calaptin-80? Calaptin-80 is a need to basis medicine. It is always advisable to consult your physician before you start/stop taking the drug. Avoid taking such decisions on your own and do not self-medicate. You have allergic reactions to the salt or any of the excipients (such as lactose) present in the formulation. Possible effects of over dosage vary from person to person. If overdose of the drug is suspected, contact your doctor immediately. Inform your physician if you have previously had heart problems. If you are 65 years of age or above, caution should be taken while using this drug. Consumption of alcohol may increase stomach problems. Inform your physician if you have any kidney or liver problems. Tell your doctor before starting a new medication including OTC, herbals, etc.